Everyone has their "off" days! 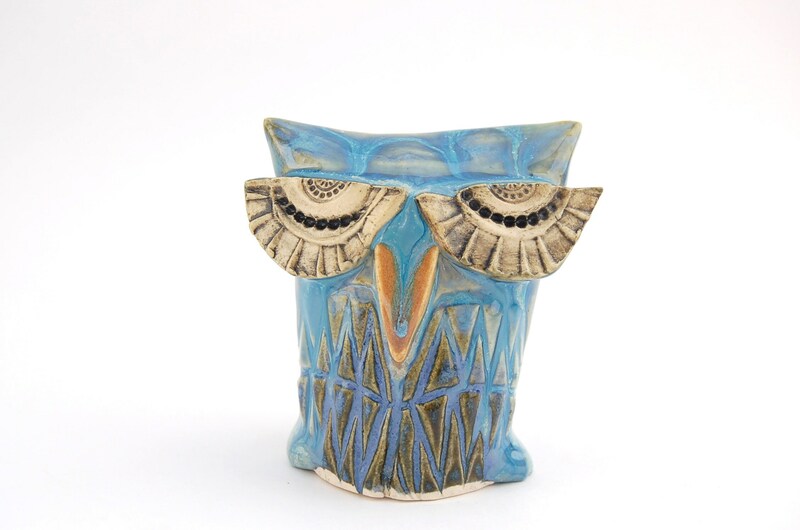 Grumpus is a hand built ceramic owl with attitude that can commiserate with you when the time comes. Meh! Grumpus was formed from a small stoneware clay slab that was textured with a hardwood stamp. His eyes were also impressed with a hardwood stamp, costume jewelry and a vintage button. His eyes and beak were cut from separate slabs and attached via slip and scoring. Two glazes were layered atop one another on Grumpus' body, creating lots of flow and obvious drips all over, including two large ones on each side of his body, that were smoothed down with wet sandpaper. He has a high gloss finish excepting his eyes, which were stained and wiped back with black velvet underglaze.